Now that the summer is here, many paleontologists are out in the field and the time between paleontological articles gets bigger. This week, we’re going to talk about an [article] that was published back in May 2016. The authors wanted to see if the diet of theropod dinosaurs changed over the last 18 million years of the Cretaceous. To do this, they examined the shape of the teeth of over 3100 theropod teeth from four groups – dromaeosaurs (the raptors), troodontids (smaller carnivores related to dromaeosaurs), Richardoestesia (a medium sized theropod from North America), and the toothed members of Aves (birds and their closest relatives). They analyzed how the shapes of the teeth changed over the last part of the Cretaceous to figure out why the birds made it through the extinction, but the small carnivores did not. The shape of the tooth and the number and shape of the denticles (little ridges) on the tooth can tell you what the animal was eating. Now, modern birds have beaks of all different shapes and no teeth so at some point in their history, a beak became a more useful food-getting tool than teeth. 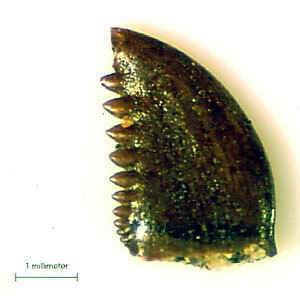 A troodontid tooth (from the Science Museum of Minnesota). The authors found that tooth shape remained stable (did not change) in these groups during those last 18 million years. The stability they found means that the environment was not changing or worsening during that time. The authors found that instead of dying off little by little, these groups of theropods went extinct all at once. But why? When the meteorite hit at the end of the Cretaceous, it had many world-wide consequences. One of those consequences may have been wildfires that destroyed much of the habitat and food for many dinosaur species. The animals that used teeth to catch food had less food to catch. The animals that had beaks were able to use a different resource, completely unused by toothed-dinosaurs: seeds. 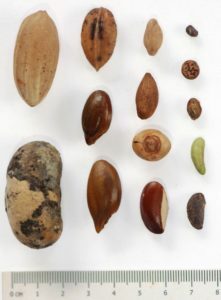 A variety of seeds (by K.L.Moses). Seeds are amazing because, like an egg, they contain all of the nutrients a baby plant needs to grow until it can eat (or gather sunshine) on its own. Seeds are resistant to fire, can be scattered on the ground for years and years, and they are packed with nutrients. The birds, with their beaks, could easily crack the seeds open and eat them, whereas the toothed dinosaurs could not, and so the birds didn’t go extinct at the end of the Cretaceous. 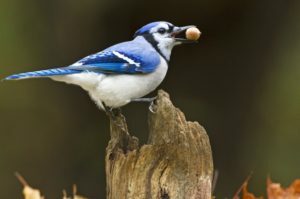 A blue jay holding a seed. (From here). We can even see this today when fires destroy forests. The birds that eat seeds are the first to return! They eat the exposed seeds off the ground, and help to disperse them, creating new forest wherever they go.